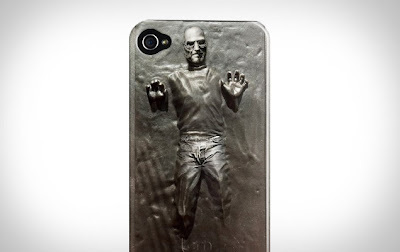 The lawyers at Apple have ordered a cease and desist on an iPhone case. Nay, on the best iPhone case I've ever seen (even better than the hand-carved Bamboo ones). Steve Jobs. In Carbonite. Star Wars reference AND making fun of Apple? Just kidding. Seriously, though. Isn't that hilarious?